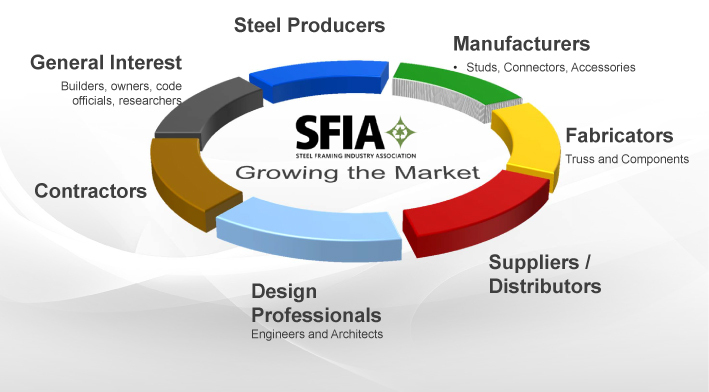 SFIA is the only organization where members come from virtually every facet of the construction industry, including steel mills, coil coaters, stud and connector manufacturers, component fabricators, engineers, researchers, suppliers/distributors, and builders and framing contractors. This broad membership enables us to identify issues and opportunities, along with programs and solutions that can be effectively implemented across the industry. The Steel Framing Industry Association Board of Directors ensures that the entire industry supply chain is given a vote in the decision-making process, with guaranteed seats for steel producers, manufacturers, contractors, and suppliers/distributors, and the opportunity for all other member categories to serve on the board as Officers.